Going birding in a new location is always fun. When you bird at the same place over and over, you start to know exactly where and what to expect, to see throughout the park. When you start birding a place that you have never been before, you have to analyze the habitat and figure out where the birds will be. You won’t know exactly what species to expect. You may be able to guess pretty closely what will be in which areas but you still won’t know exactly what to expect throughout the park. This past weekend I went down to Cincinnati and was able to do some birding with my brother at Miami Whitewater Wetlands. At this time of year the possibilities are almost endless at this location. Possibilities can’t be endless but this place is about as close as it comes. There is excellent habitat for almost any species of sparrows and some good habitat for migrating warblers and other tree dwelling passerines. We only had a short time before we had to meet the rest of our family for lunch and a great Colts game so we quickly headed out into the middle of the now dry marsh. 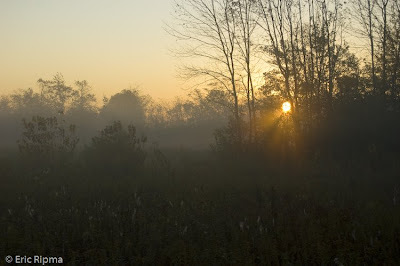 Sunrise at Miami Whitewater Wetlands. Our main target birds were LeConte’s and Nelson’s Sharp-tailed Sparrows both of which are somewhat uncommon and most of the time very difficult to find. Lucky for us we were able to find both fairly quickly and got very good looks at both of them. While trying to find them we also found a Sora and many other sparrows including many Swamp, Song, Field, White-crowned, White-throated, and Lincoln’s Sparrows. I have never been to any other location with as many Lincoln’s Sparrows. Their usual habitat is along tree lines with lots of undergrowth but at Miami Whitewater Wetlands we had them not only in their usual haunts but also out in the marsh. As these are one of my favorite sparrows this made it a great day.